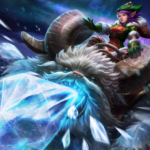 Joule takes reduced damage from basic attacks that hit her from the front and sides. Damage is reduced by 15 – 33% (level 1 – 12). Joule leaps to a target location. Enemies caught underneath Joule take full damage and are stunned, while enemies near the impact are knocked away, slowed and take 1/3 the damage. Joule thrusts her sword forward, arcing a bolt of energy out through the blade. This strike deals both weapon and crystal damage in a line in front of her. When this successfully strikes an enemy, the next Thunder Strike within 7 seconds will deal bonus damage and cost extra energy. This buff can stack up to 5 times and is lost when stunned. When maxed, this ability can crit weapon damage. Joule fires a massive beam of energy in a target direction that continually deals damage to all targets along its path. The force of this beam pushes Joule backward during channeling. Joule has left the streets for Mech Academy and upgraded her prototype to the real deal. 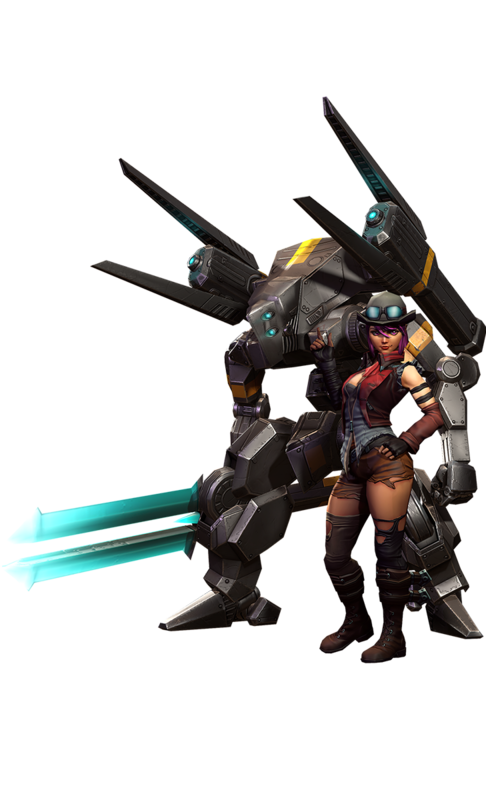 In this deviation of Joule’s character, she joined a mech academy, became an officer and got her own battle-tested mech to go along with a battle-tested Joule. Her relationship to this mech is just as strong. Her personality is the same, but her destiny is different. Her new mech is more refined, rather than a pieced-together prototype. 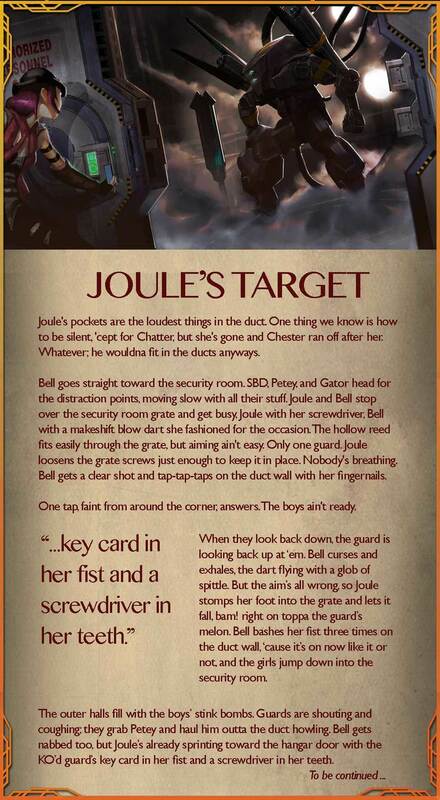 There’s nothing haphazard about Killa-Joule or her mech. They’re calculated. This skin fulfills the mech officer fantasy. Nobody wants to be a chicken but still, after Chester cuts open the fence, no one wants to go through. We’re all staring at one another: Chester with his wire cutters, his sis Chatter with her mouth X-taped shut ‘cause she talks too much, Gator with his bulging backpack, SBD and Petey oofing under the anchor, Bell the only one of us with a weapon. 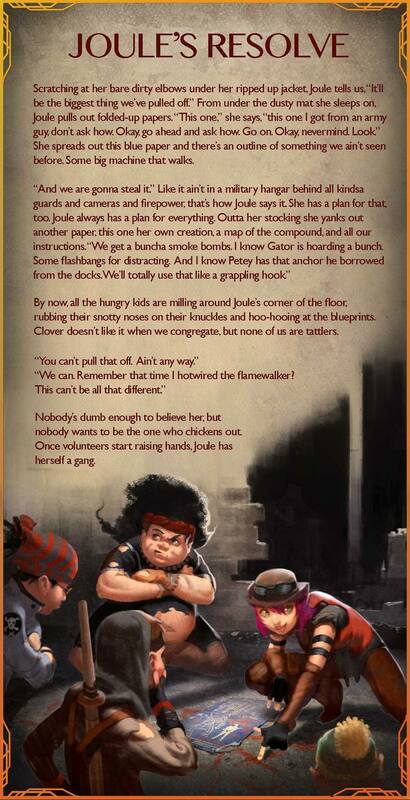 Only Joule, hunkered down like a frog, is looking at the compound a short sprint away. Just like that, we’re running, maybe just ‘cause she didn’t give us time to think about it. We’re running with red puffy cheeks through the dark yard, running like we’d stole from the Carnies. Can’t see anything in the moonless night, but we know the spot, and we land there at the door marked HEAD in an unruly pile, kicking and grunting trying to get inside first. We all peek out the door just in time to see the floodlights snap on, and Chatter right in the middle of all that light, yanking at the knob to the wrong door. It’s not even seconds before she’s got guards all over her, barking in her taped-up face. “She’s gonna squeal,” whines SBD. Sure enough, one guard holds onto Chatter while the rest of them go racing off away in the other direction. “Hurry!” whispers Bell, stuffing her weapon in her pants, and Petey boosts her into the duct. 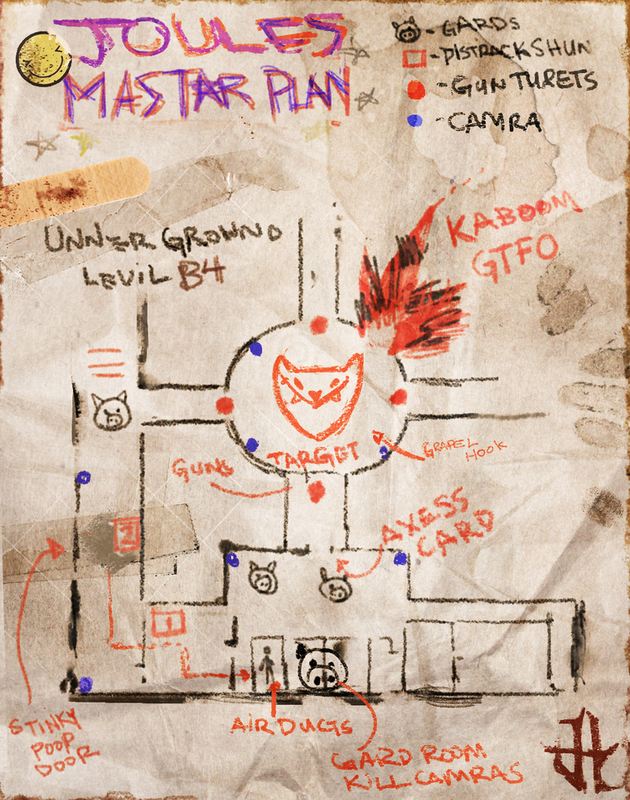 This scrap of paper was found in the Undersprawl. What does it mean? Tell us what you think in the forums.